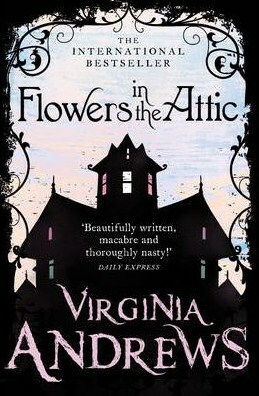 Virginia Andrews is a publishing phenomenon, with over 100 million books in print. Still as terrifying now as it was when it first appeared, Flowers in the Attic is a gripping story of a family’s greed, betrayal and heartbreak. While reading this book I was constantly thinking: “This is different from what I expected”. When I finished it I thought: “This is turning into some kind of a soap opera”. That being said I thoroughly enjoyed reading this book! By reading the synopsis of this book I was expecting to read a horrific story of children locked up in a small, dark attic, being constantly molested and/or abused, getting little or no food and just trying to escape. Well this was not exactly what this book was about. I mean, yeah, there were some of these things going on, but to a much smaller degree than what I had thought. Maybe even because what I thought was going to happen never happened, I was constantly on edge reading this book. I kept thinking to myself “something terrible is going to happen now” or “something big will happen and change the whole thing”. But nothing really “big” happened. At least in my opinion. I have heard people saying that they were really shocked by the things that were happening in this book, so I guess it’s just a matter of perception. But I was in no way shocked. As a matter of fact I was kind of laughing at the things that were happening, because after a point they started resembling more and more things that would happen in a soap opera! So, as you’ve probably understood by now, I found the storyline a bit ridiculous, but also monotonous and slow-paced. There were a lot of things that were revealed in the end of the book. And by “the end” I literally mean “the end”. Like the last 20 pages or so. But also in the last 70 pages there were some major things happening and a kind of twist to the story. Moving on to the characters, I found Cathy, the main character and narrator, quite ok. I had no problems with her and I found that she reacted in a normal way most of the times. I enjoyed her impulsiveness, but other than that it was a kind of “plain Jane” character. The one that bugged me a little was the oldest brother, Chris. He was the perfect optimist and those kind of characters often get on my nerves. Also he kept believing things would happen, even when all evidence clearly showed that they were never going to happen. Yes… he was pretty annoying! So you might be wondering why I rated this book 4 out of 5 stars since there were so many things I found problematic. The answer is that I didn’t mind those things. I still found the book absolutely amusing and couldn’t put it down. I think its biggest asset was the writing style. Everything was described in such a great way that made me believe that everything was really happening and kept me on edge all the time. My dilemma now is, whether I will continue reading this series or not. There is a total of 5 books in this series, but to be honest I think they will only get worse and worse. I threw a look on the synopses (synopsises?) and they definitely get more and more like a soap opera (soap-opera-y?). So what is your opinion? Should I continue with this series? Truly, when I was very young, way back in the ‘fifties, I believed all of life would be like one long and perfect summer day. Completely different from what I expected. I found the story a bit laughable. I still LOVED the book.